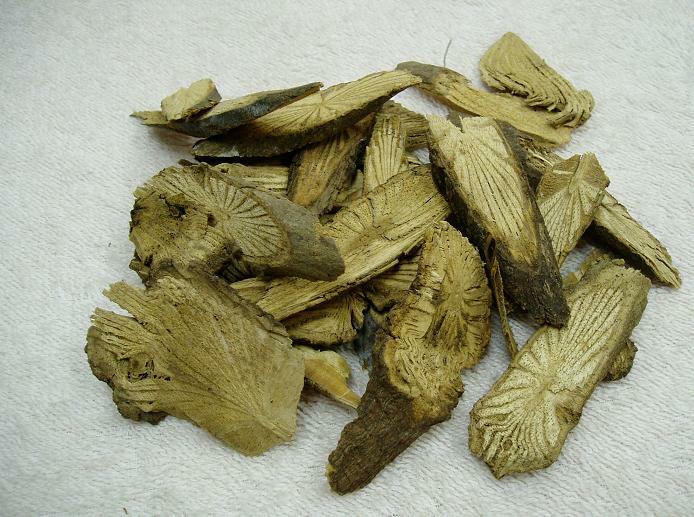 The drug is the dried stem rattan of the Sinomenium acutum (Thunb.)Rehd. et Wils. (family Menisperrnaceae), growing at wet places in woods and shrubs of hill area, distributed in Shaanxi, Henan, Hubei, Jiangsu, Anhui, Zhejiang, Jiangxi, Fujian, Sichuan of China. It contains sinomenine, sinoacutine, disinomenine, ethylsinomenine, sinactine, acutumine, acutumidine, tuduranine, magnoflorine, and a small amount of stepherine, michelalbine, dl syringaresinol, β-sitosterol, stigmasterol. Bitter, pungent, neutral; liver and spleen meridians entered. Edema, dermatophytosis, rheumatoid arthritis, tuberculous arthritis. Decoct 9~15 g, lage dose can be 30~60g, or soaked in wine. Proper dosage is for external application, pounded for applying or decocted for washing.